My local mall has a Lush Cosmetics store. To my absolute amazement a few weeks back I saw this display in their front window. A very positive transgender message. 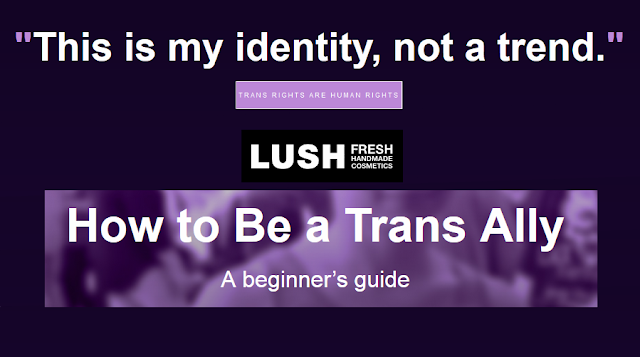 Upon returning home I went to their web site and found the article "How to Be a Trans Ally". I have copied it below. 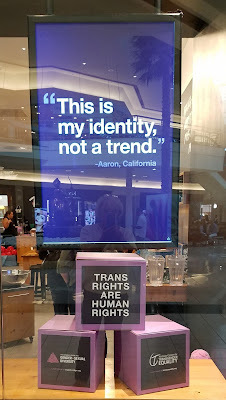 A wonderful message - Thank you Lush. One of my new favorite stores. Being an ally starts with all of us. See also the Huffingtonpost article: "Lush Puts Trans Rights Movement In The Spotlight With New Campaign".